Believe it or not, ever since I read the story of “Hansel and Gretel” many years ago, I have been obsessed with deep forest. I was fascinated when I was able to hear the sounds of wild birds and smell the wet ground for the first time sixteen years ago. Back then, I was with my high school friends, wandering in the national park of Pulau Rambut. 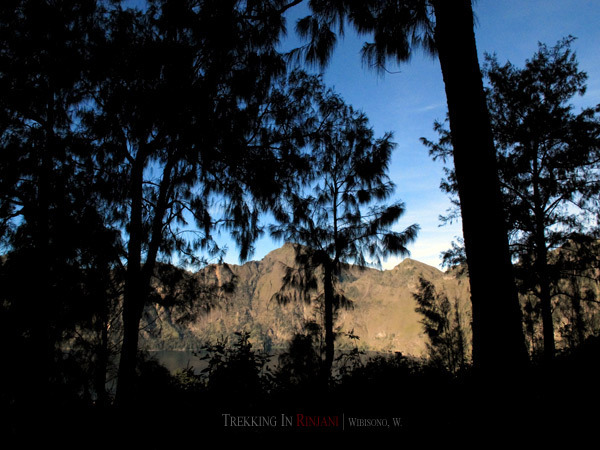 On the last day of trekking in Rinjani, we would encounter a tropical rain forest which was the main part of Rinjani’s national park that would lead us to the final point at Desa Senaru. 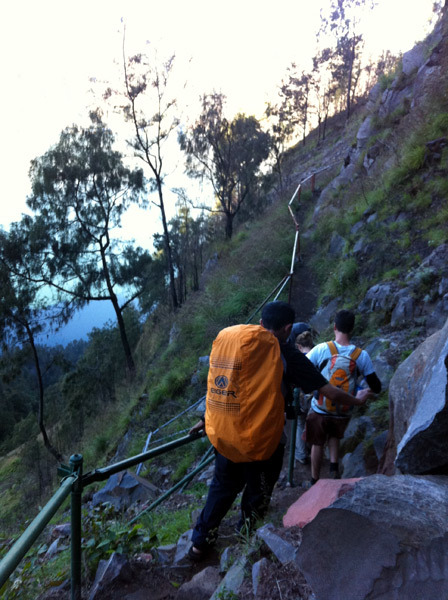 After taking a long hour sleep, due to my getting a fever, I woke up at six in the morning to start the last trek. We had pancake and toast, served with a cup of hot tea for breakfast. If I hadn’t taken the pictures of the lake on the other day, that morning I was eager to press the shutter button of my camera, capturing the lake and its surroundings, even though it wasn’t as magnificent as it looked in the afternoon. 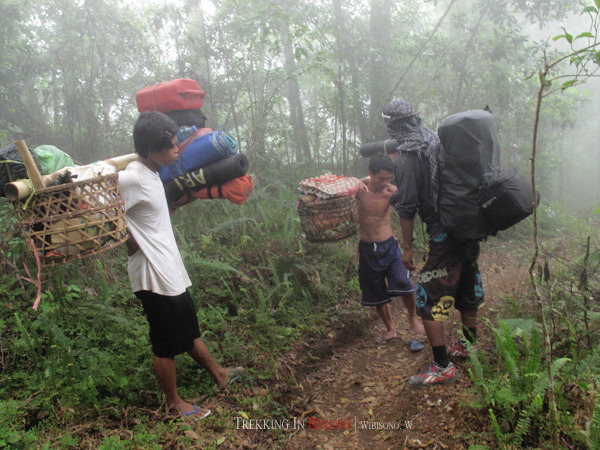 Since my toe nails were about to pop out and injured from the previous-day trek, I put on my mountain sandals and let the porter bring my trekking shoes on his basket. 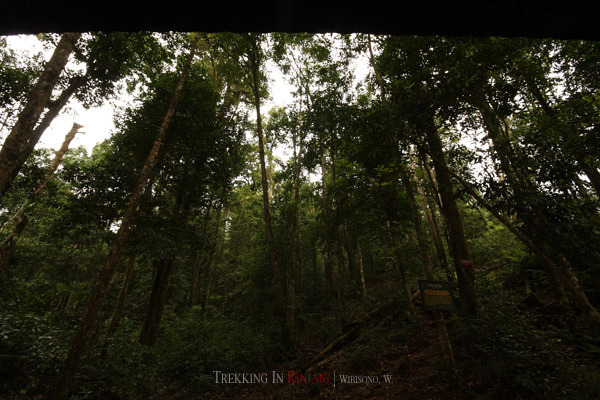 To reach the final point at Desa Senaru, we first had to reach the camping ground at Plawangan Senaru. That would mean climbing up rocky path. Too rocky that at some points we had to climb with our hands. It was almost like rock climbing, only lower. The path was so narrow that we had to step aside whenever we passed by other people coming from opposite direction. 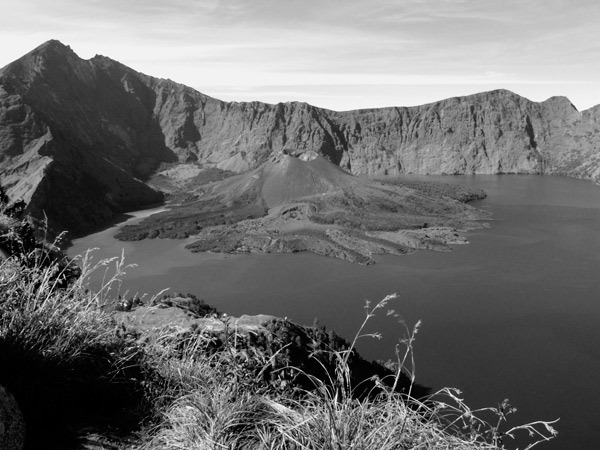 The path we had to walk through might be tough, but we were rewarded with beautiful scenery of the lake and the new volcanic mountain below. 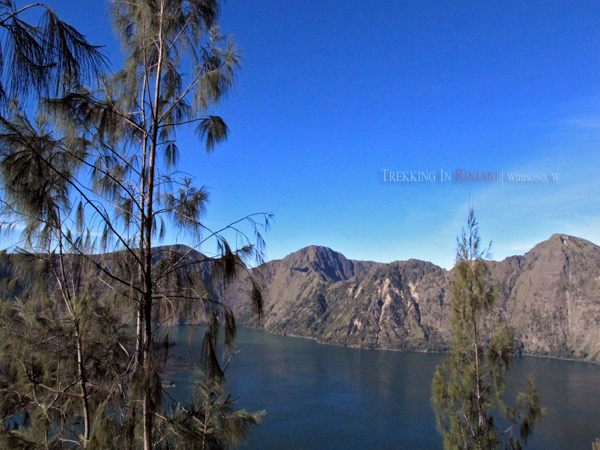 Three hours of climbing up from the lake, we reached the camping ground at Plawangan Senaru. There, for the last time, we took pictures of the lake, because after that, we were going to climb down another rocky path before entering the rain forest. At this point, the group was again split into two, considering my feet and also because Karen and Patrick had to catch a ferry to Gili Trawangan, a tiny island where they were going to stay overnight before departing to Jakarta and fly back to Canada. They were guided by one porter. The other porter and Syaiful, remained with me and Gilang. My feet were still hurt. 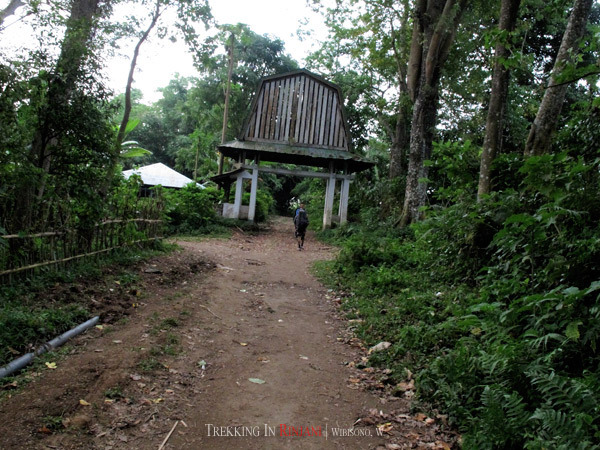 Along the path down to the forest, my nails kept bleeding every time I pressed my toes against the sandals. Many times Gilang advised me to walk with the heels instead of the toes. It sounded easy of course, but believe me, it was something challenging to do, especially for me who was not accustomed to walking with heels. 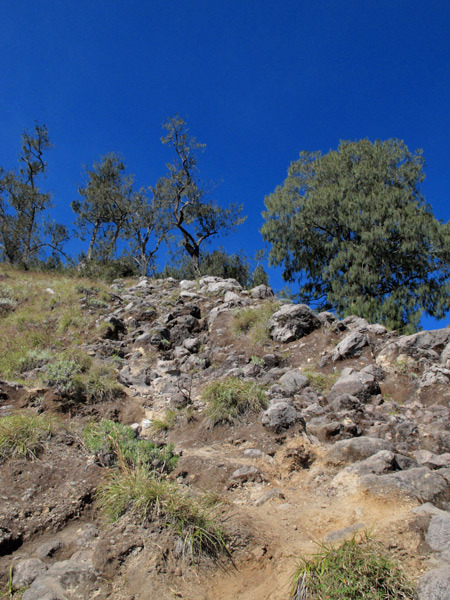 At one point, I took a picture from below, trying to show you the rocky path that we had walked through from Plawangan Senaru. It was a relief for me when we finally walked on flat ground. 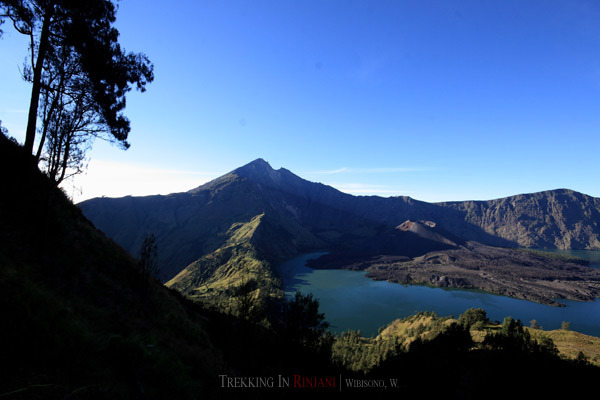 Like the other days in Rinjani, the fog would come down around the midday and afternoon. 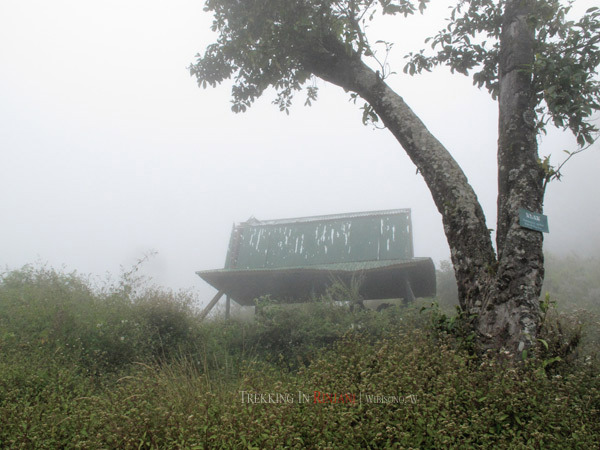 We stopped for a while at Cemara Lima, 2508 meter above the sea level, before entering the tropical forest. Then, there came my favorite part, walking along the path inside the woods. Syaiful picked up a strawberry that grew in the forest. Its size was smaller than the regular one I found in mountainous towns of Ciwideuy and Pangalengan. The forest was home for hundreds of monkey, which according to Syaiful, were divided into two different species: the grey ones and the black ones. While we stopped by at post three for a break in the midday, I found a gray monkey who was enjoying his lunch. I tried to capture the moment with video from my Canon G-12. The gray monkey was so much friendlier with human than the black one. 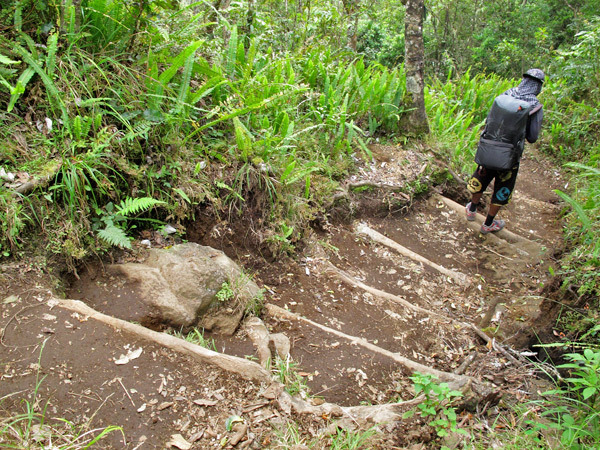 From post three; 2000 meter above the sea level, we walked to post two which was 500 meter lower, walking along the descending path which was dominated by naturally made stairs of roots. 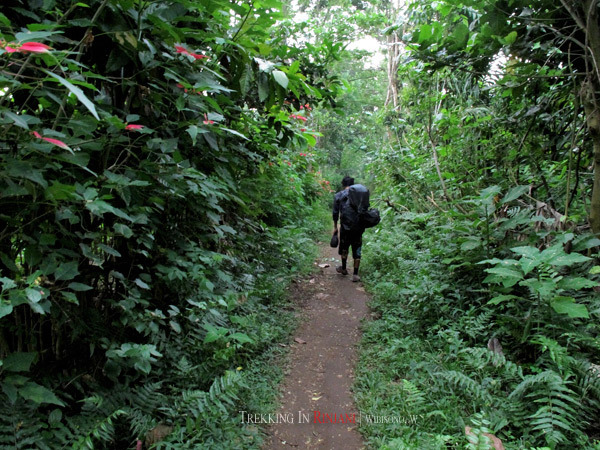 Gilang walked hundred meters ahead with the porter. At post two, we took a lunch break where I threw up nearly all the spaghetti I had eaten. Apparently, I was not recovered yet from the mountain sickness. The only thing I had in mind was how to return to the ‘normal’ civilization as soon as possible, so I could have a descent way to poop and pee. 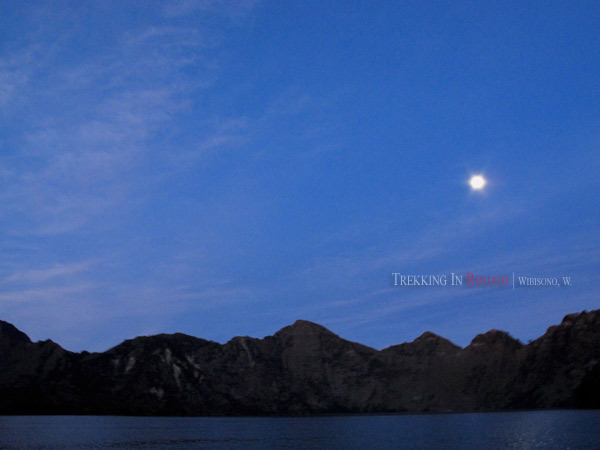 It had been eleven hours since we left the camping ground at the lake of Segara Anakan. 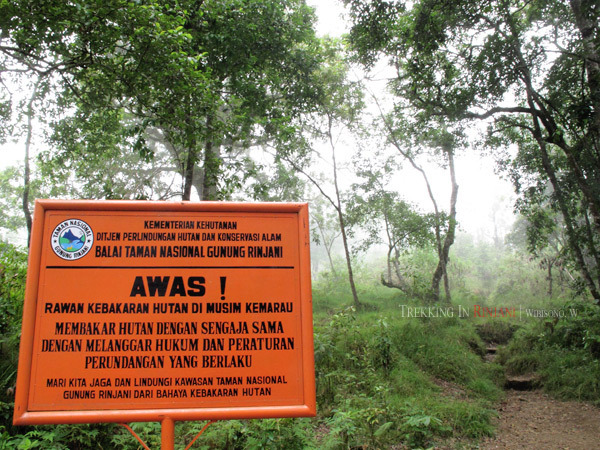 We finally reached the gate of the national park which was called Jebak Gawah by the locals. 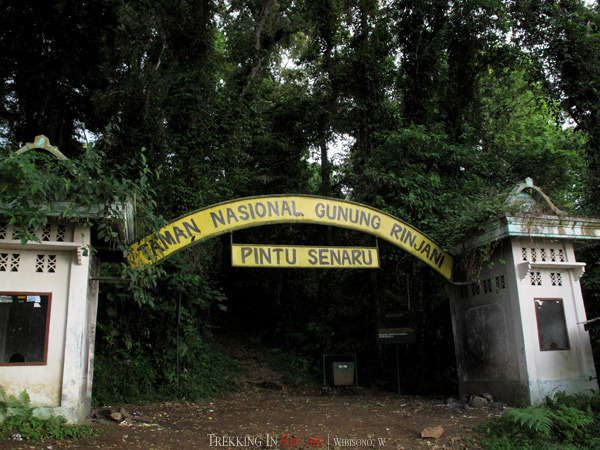 By most trekkers, this gate was considered as the starting point of the trek from Desa Senaru. There, Gilang and I had to say good bye to “Mister” Adi who had been our porter since the first day of the trek. After tipping him and shaking his hand, we moved forward to the last point where we were going to be picked up by the trekking organizer with a car that would take us to Senggigi. At 5.40, we reached the last point, left behind the national park. A car had waited for us. We went first to meet Pak Harry, the organizer, at his house. We said good bye to Syaiful who had been very nice during our three days of trekking in Rinjani, and promised to keep in touch. We went straight to Senggigi that night. At around eight, we arrived at a guest house in Senggigi, not so far from the beach. Gilang went out to buy dinner and a medicine to overcome my fever. After taking a shower, I had dinner and took the pill. When I was about to sleep, I couldn’t help but trying to convince my self that we had actually reached the summit, the highest point of the mountain. But every time I feel my legs, yes I would be convinced. 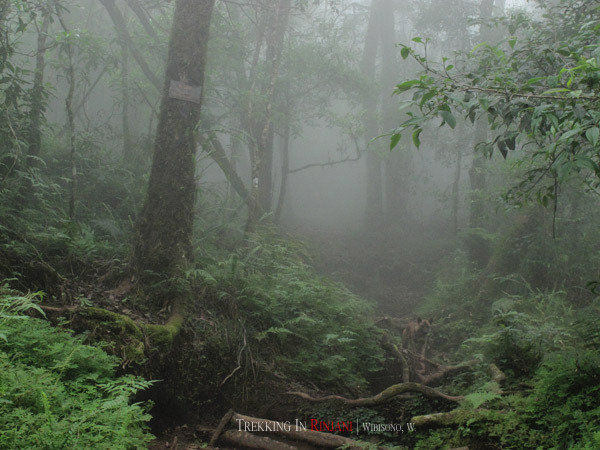 will wait for your invitation for the next trekking!! don't forget..! i already get a green light to have "me time" starting from next year... hehehe..
Hahaha... I'm glad to hear that. Are you sure you want to trek in a mountain? 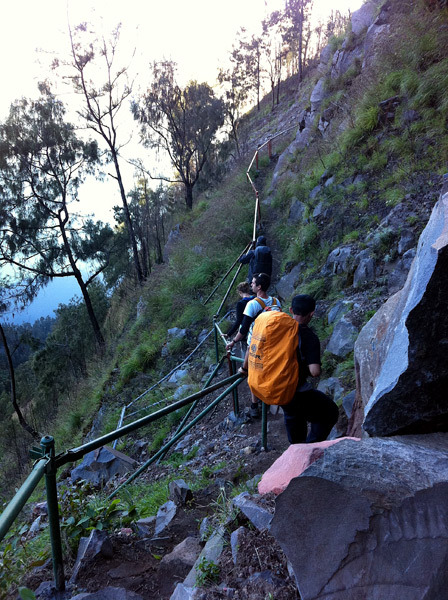 It's like many times harder than the one we did at Ijen. Anyway, I will let you know whenever I plan to trek in a mountain again. one thing i do not know, how come you climbed in 2 night but went down is only 1 day isn't it? Which part did you find hard to conceive? 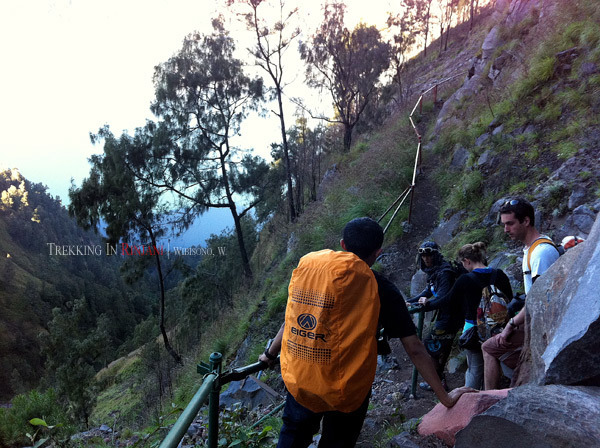 First day trek: climb up from Lawang Sembalun - Plawangan Sembalun (1st camping ground). Second day trek: climb up from Plawangan Sembalun - Summit, and then climb down from summit - Plawangan Sembalun (return to the camping ground). 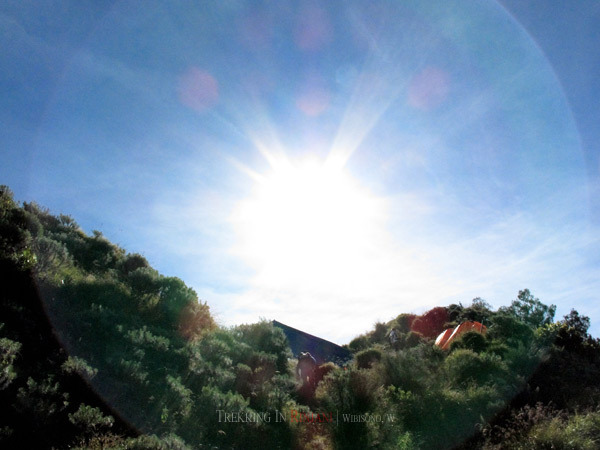 From camping ground, we climb down to the lake to stay overnight. That's the 2nd camping ground. 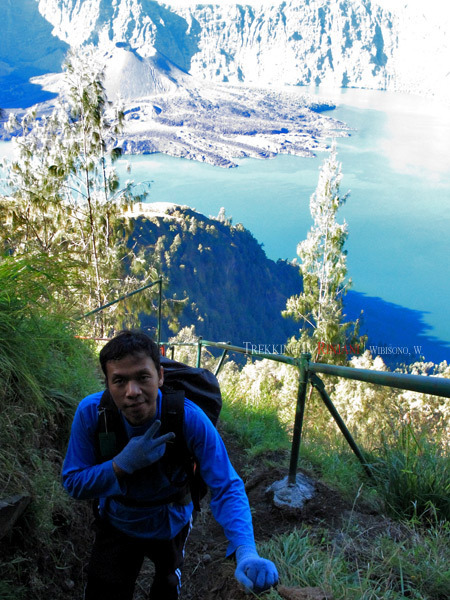 Third day trek: climb up from the lake to Plawangan Senaru. 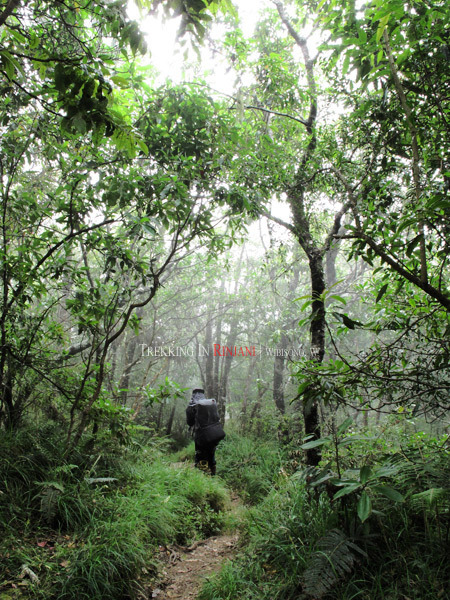 And then, climb down from Plawangan Senaru - Desa Senaru. 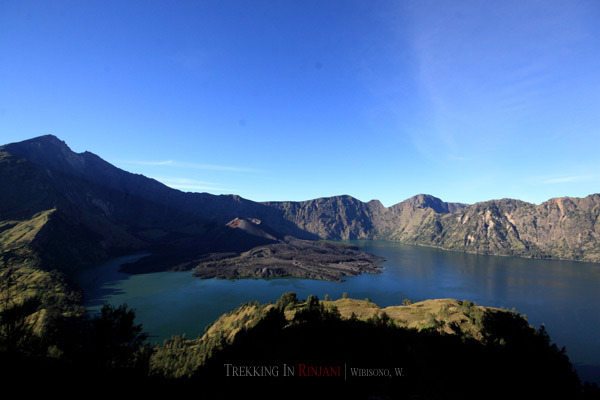 Just take a look at each map I've posted in each journal of Rinjani. 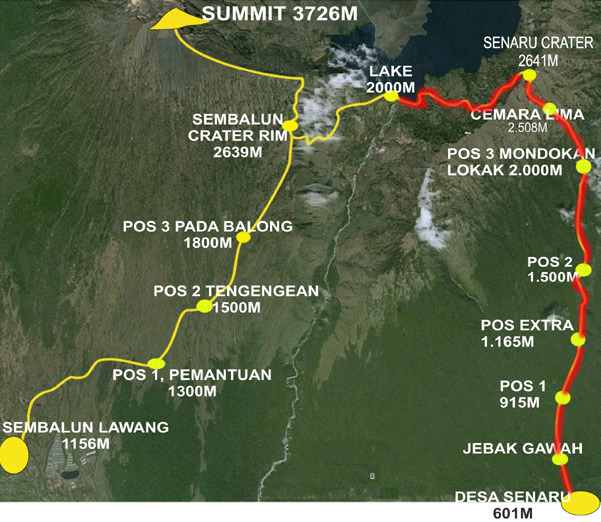 The latitude number (above the sea level) will help you understand the route. If I'm not mistaken, there were about five or four points with an iron hand-rail. 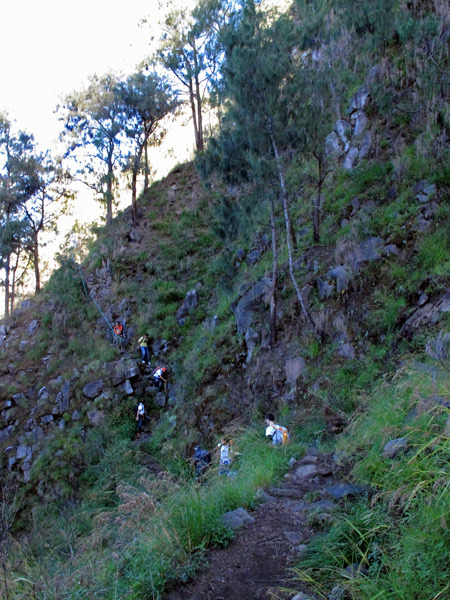 The paths were extremely steep and stony. Please don't walk too fast, ok? hahaha. Yeah, I've browsed around about Merbabu. It seems nice. We should plan to go there one day. hayuuu.... Enaknya bulan apa ya? 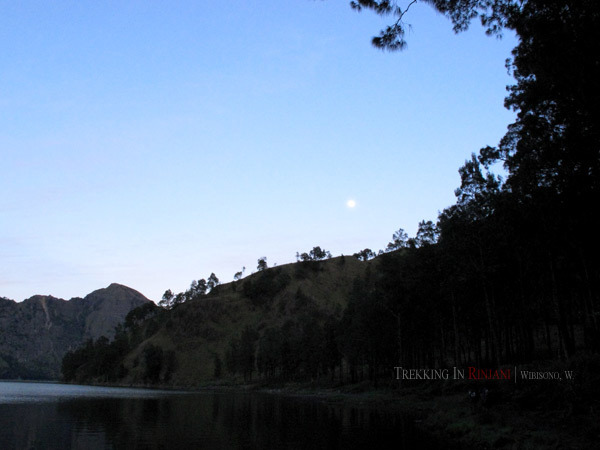 ikut ddong.. semeru yuk.. ranukumbolo. Yuk, Semeru. Kemaren liat foto2 orang yang abis baru dari sana. Bagus pemandangannya. Kapan Gil? you got the mountain sickness and fever? can't imagine how hard is it. I love the sky, so clear. If I had those two in Jakarta, yes I would be miserable. Since I had them in a place where I had no choice, I managed to survive. Kind of "human instinct" I guess. Could only imagine how painful it was to walk with bleeding toes. But i guess it was nothing compared to the excitement of reaching the summit. Thanks for coming to my blog. Believe me, it's not as scary as it sounds. What happened to me was because I didn't have enough sleep at night. I don't know, may be I had an issue with sleeping outdoor. Normally, people trekking in that mountain would sleep right away in the dusk. They had a good quality rest. As for me, I couldn't sleep at night and to be honest, I didn't really enjoy the meal. So I guess: lack of sleep + lack of nutrition (carbohydrate was really necessary) = miserable journey. Have a nice trip mate!